The player took to Twitter to defend his teammates following recent allegations in the Daily Mirror. Barton looks set to play Championship football next season. 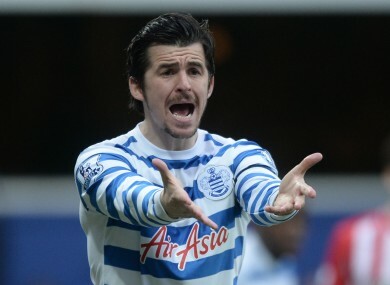 JOEY BARTON HAS branded a report that claimed five QPR players were ‘bad eggs’ as a piece of ‘clueless journalism’. The one-time-capped England midfielder was relegated to the Championship along with his teammates on Sunday afternoon following their 6-0 defeat to Manchester City. Barton said in an interview last week with Sky Sports that while most players in the squad pulled together, there were one or two bad eggs that had ‘spoiled it’. The Daily Mirror then decided to ‘reveal’ that Adel Taarabt, Armand Traore, Mauro Zarate, Mauricio Isla and Eduardo Vargas had angered Barton and his teammates with their “staggering complacency”. But Barton defended the players by tweeting : “Another piece of clueless journalism circulating this morning regarding me and QPR. “For the record, I don’t believe Vargas, Isla, Zarate, Taarabt or Traore are responsible for QPR’s relegation. Email “Joey Barton hits out at 'clueless journalism'”. Feedback on “Joey Barton hits out at 'clueless journalism'”.